No. This isn’t a bona fide piece of history but well, its movement is. 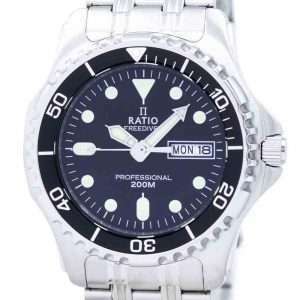 A roundup of the features of the Ratio 32GS202A you’ll scroll through in a moment; it will be easier to decide how much you’d trust it deep beneath the sea. 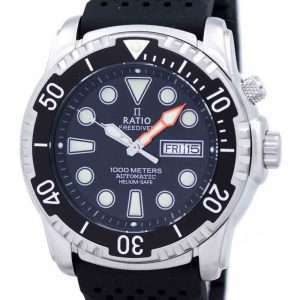 The Ratio 32GS202A is your more affordable dive watch when – leave Swiss- even Japanese models appear expensive. Or, you just want a lesser known brand with high-grade diving features which you won’t regret if lost. 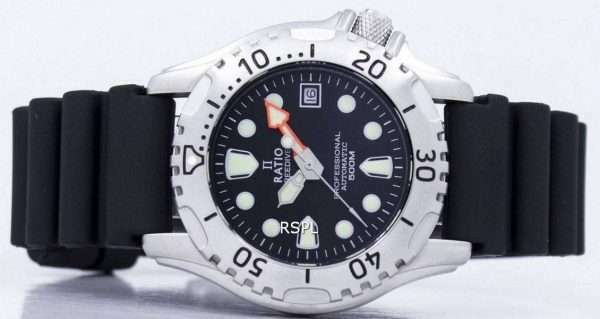 There’s no dearth of gents’ stainless steel diver watches going several hundreds of feet deep and fitted with technically fit, workhorse mechanical movements; sapphire crystals and PU straps – still, the Ratio 32GS202A Diver come with pleasant bits of surprises that are entirely its own. 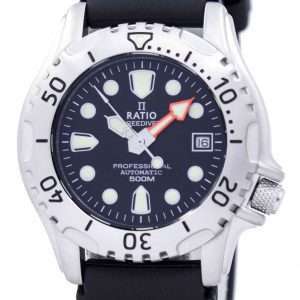 It doesn’t claim itself to be better or equivalent to a Rolex Submariner or an Omega Seamaster or any such other mega-expensive models – what it offers is a pretty close resemblance to the options provided by the big brands out there. 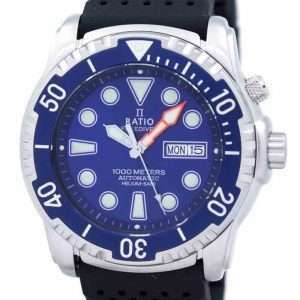 The Ratio 32GS202A is an attractive and affordable dive watch with a self-winding mechanical movement inside a classic, stainless steel case. It’s scalloped, unidirectional, brushed stainless steel bezel has prominent, sharp markings and there are large luminescent markers on the dial and at 12 on the bezel. 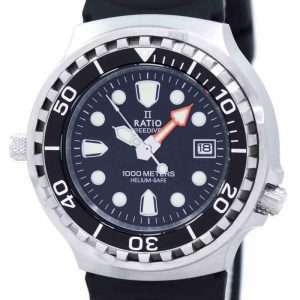 Its water resistance maxes at 500M, so it’s safe till 1000 feet deep. Do you dare? There’s no rear viewing window, however; instead, it’s a thick slab of curved metal screwed to the back. 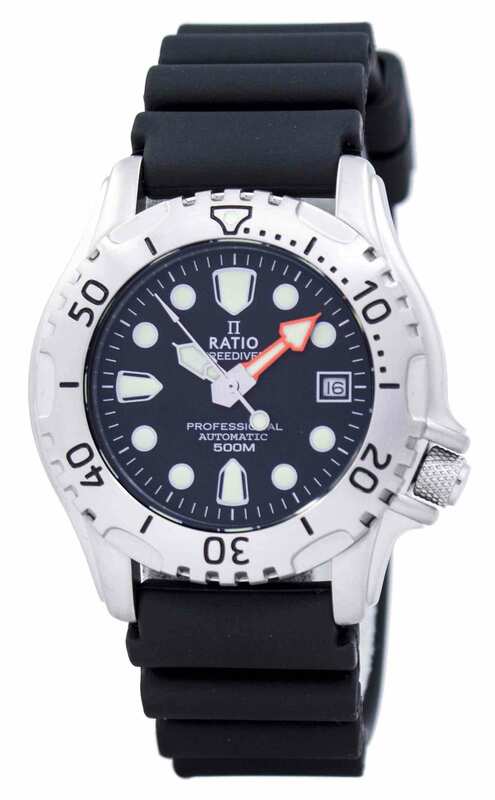 The lack of text and shape engravings imparts a more somber look; just a diver emblem and bare essential two lines. 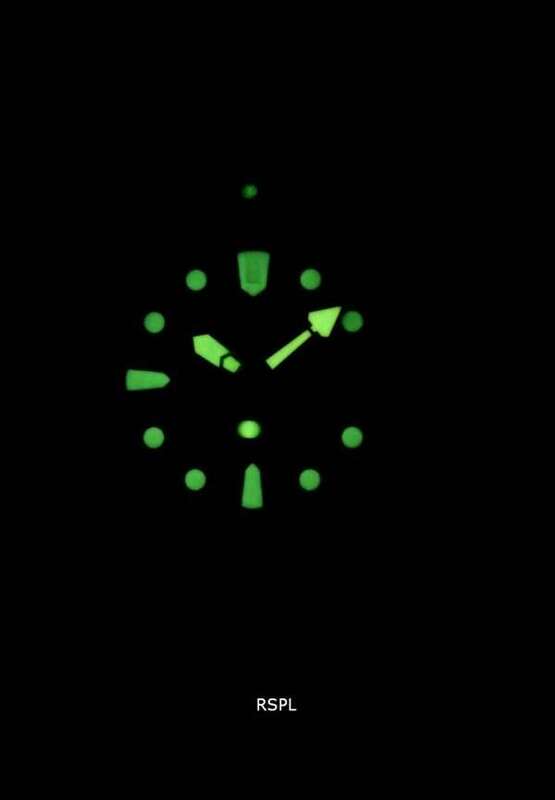 Its dark, high contrast face boasts red and green on black that keeps your track underwater. 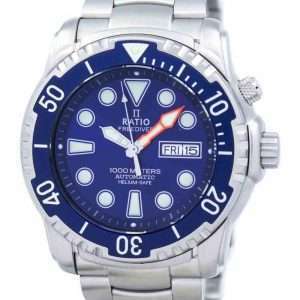 The Miyota 8215 self-winding automatic movement with a 40-hour power reserve makes it a solid watch not just for the summer. The combination of great looks and quality build makes it an all-season hit! 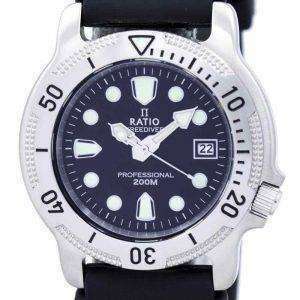 The Ratio 32GS202A Diver takes from the most striking and respected divers’ watches that are apparently visible from its bold face and striking, mint-green minute hand and indices. 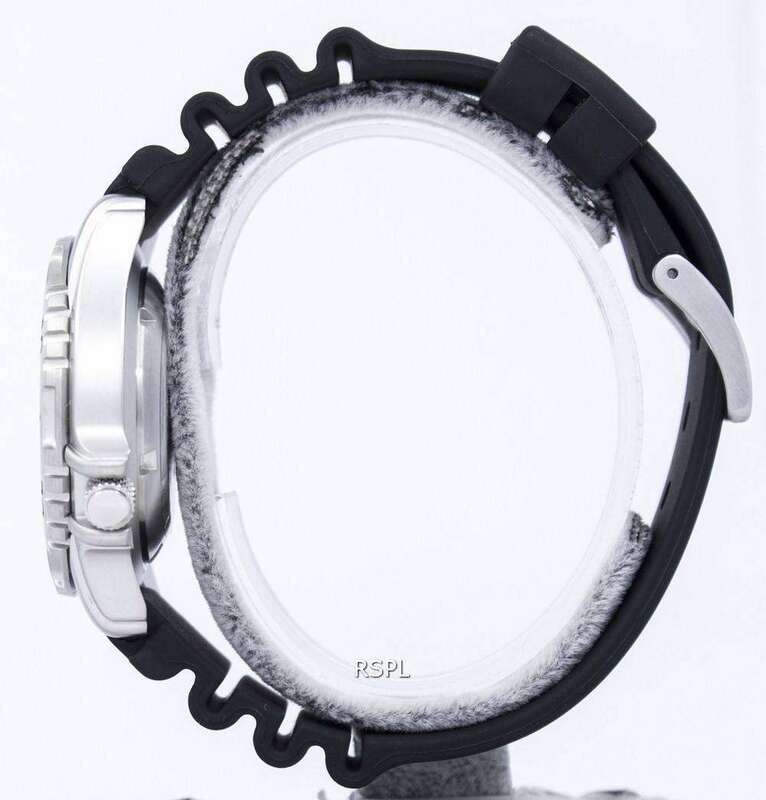 Its mix of silicone and natural rubber for the band; it offers good resistance to extreme temperatures. It is also highly inert with chemicals. Here, too; a refined material meets a natural product and are perfected with additional additives. 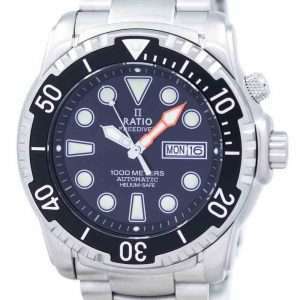 The Miyota caliber 8215 is a 21-jewel, mechanical automatic movement found also in more expensive watches. 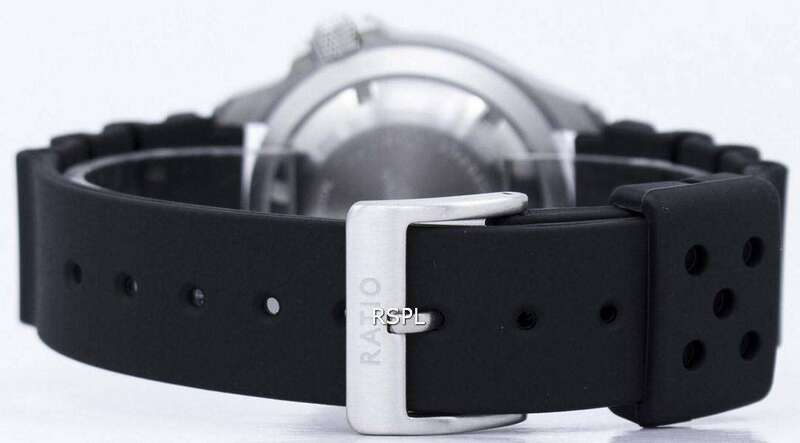 It was introduced in 1977; since then, it has stayed easily obtainable, low cost and considered a workhorse movement among the mid entry-level watches. 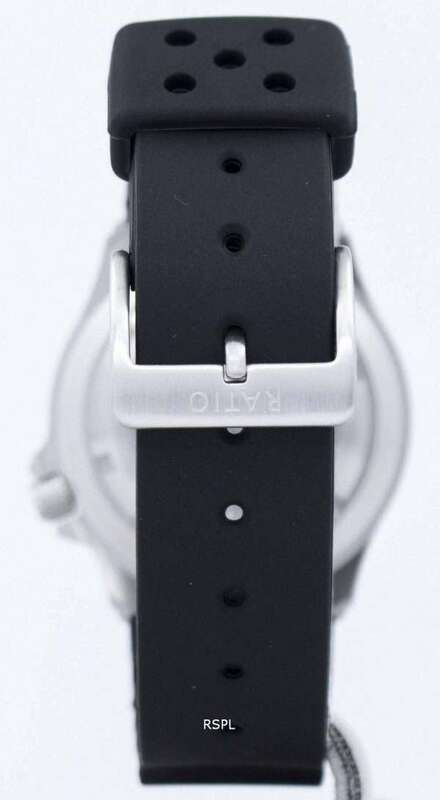 Its indirect, sweep-seconds design is what mid-tier Swiss watches use frequently for it allows much room to make a simple room elegant. The top plate encompassing both the time and winding trains give a view of the sweep-second pinion driven by the 3rd wheel and passing through the center wheel. Its brake spring effectively removes jitters and if knocked, the pinion moves partially for a second and then catches up again, without making any difference to overall timekeeping. 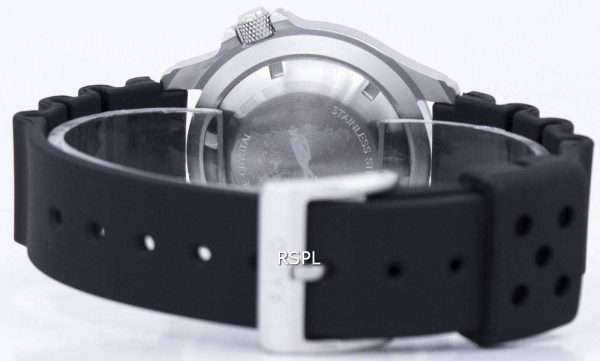 The watch world calls it the HSh (Hesitating Seconds-hand) Syndrome.